American playwright Neil Simon answers questions during an interview in Seattle, Sept. 22, 1994. Simon, a master of comedy whose laugh-filled hits such as "The Odd Couple," "Barefoot in the Park" and his "Brighton Beach" trilogy dominated Broadway for decades, died on Sunday. He was 91. 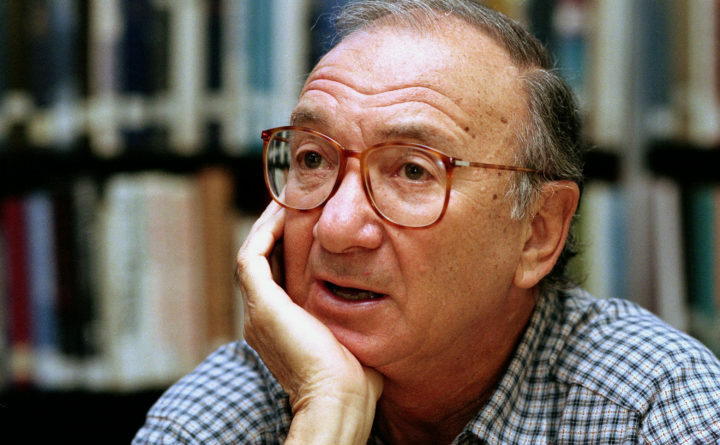 Neil Simon, the Pulitzer- and Tony-winning author of plays such as “The Odd Couple,” “Barefoot in the Park” and “Lost in Yonkers,” who died Aug. 26 at 91, was often called the world’s most popular playwright after Shakespeare. Time magazine proclaimed him the “patron saint of laughter.” His shows, with an arsenal of sarcastic wit, became highly entertaining staples of high school and community theaters, and they popped up on stages as far away as Beijing and Moscow. But mostly, he dominated Broadway like no other playwright of the past half-century. Hardly a year passed from 1961 to 1993 without a new production by Simon, whose legacy was a colossally successful run of comedies and comic dramas on topics such as romance, adultery, divorce, sibling rivalry, cancer and the fear of aging. Several are regarded as classics of 20th-century American theater. His output included dozens of plays, the scripts for five hit musicals, more than 20 screenplays and two volumes of memoirs. Many of his earliest shows were directed by Mike Nichols, who once said that much of Simon’s work will endure because of its “recognizability” — mining laughs from situations familiar to a vast middle-class public. In the late 1960s and again in the mid-1980s Simon had four shows on Broadway simultaneously, the only times since Avery Hopwood in the 1920s that a playwright had achieved such a feat. His mind was a ceaselessly creative engine, turning out original movie scripts and screen adaptations of his own plays at a fantastic clip. “And I work at the post office during Christmas,” he quipped. Because of his works’ commercial power, Simon’s stage and film projects often attracted big names, including Robert Redford, Jane Fonda, Walter Matthau, Jack Lemmon, Nathan Lane and Maggie Smith. He helped make a star of Matthew Broderick with “Brighton Beach Memoirs” (1983), which ran for three years on Broadway. His crowning early comic achievement was “The Odd Couple” (1965), which became a hit film and TV sitcom and introduced two characters now embedded in pop culture: the sloppy, fun-loving Oscar Madison and the fussy neatnik Felix Ungar. The friends — one divorced, the other about to be — share a New York apartment and bicker like spouses. The New Yorker theater critic John Lahr once praised the show for its “exquisite precision” of language. Simon said most of his works involved seemingly incompatible couples “being dumped together in a confined space, physically and emotionally.” Among them were “Barefoot in the Park” (1963), about newlyweds awakening to their deep differences, and “The Sunshine Boys” (1972), about former vaudeville partners who can’t stand each other but are forced into a televised reunion. Simon won Tony Awards for “The Odd Couple” and “Biloxi Blues” (1985), the latter being part of his semi-autobiographical trilogy that included the long-running shows “Brighton Beach Memoirs” and “Broadway Bound” (1986). He collected the Pulitzer Prize for drama and another Tony for “Lost in Yonkers” (1991), a comedy set in 1942 about multigenerational domestic conflict. The most gripping moments, critics said, involved a tyrannical German-Jewish matriarch who clashes with her emotionally childlike adult daughter. “Lost in Yonkers” brought Simon the dramatic credibility he long sought. But he said the hardest show he ever wrote was the door-slamming farce “Rumors” (1988), about socially prominent friends who try to hide what looks like an attempted suicide by a deputy mayor of New York. Simon explained, “It’s got to be funny almost every 15 seconds,” a steep challenge even for a writer who described himself as a disciplined loner who was happiest when he spent his day with only a typewriter for company. Among them: “Plaza Suite” (1968), a bittersweet trio of one-acts set in the same New York hotel room; “The Last of the Red Hot Lovers” (1969), about a lonely married man’s hapless attempts at infidelity amid the sexual revolution; and “The Prisoner of Second Avenue” (1971), about the breakdown of a middle-aged executive who has been sacked from his job. At a basic level, Simon said he wrote about himself, his family and his friends. He grew up poor in Depression-era New York, a situation made desperate by a woman-chasing father who abandoned the family eight times. In the 1980s and 1990s, Simon faced a backlash from powerful critics who thought that his serious-themed works were concerned more with setting up a punchline than presenting fully rounded characters. He was often faulted for dipping his toe into mature themes without risking a high dive into full-scale tragedy, and not risking more politically or socially daring plays. Marvin Neil Simon was born in the Bronx on July 4, 1927. He grew up in Manhattan, where his father worked as a salesman in the garment district. At 3, Neil earned his lifelong nickname, “Doc,” because he toted a toy medical kit and diagnosed everyone as sick. With his father’s absences, his mother was forced to take in boarders and send her older son, Danny, to live with other relatives. Simon also recalled the trauma of being about 7 and seeing his father on the street with another woman. He told his mother and begged her to keep it secret, he recounted to The New York Times. He took refuge in Charlie Chaplin movies and the droll humor of author Ring Lardner. As a teenager, Simon helped Danny write comedy sketches for employee shows at a local department store and later for the CBS radio personality Goodman Ace. During World War II, Simon served in the Army Air Forces and did basic training in Biloxi, Mississippi. The comedy, about two brothers who do not want to enter their parents’ waxed-fruit business, was a modest success on Broadway in 1961 and became a film starring Frank Sinatra. Simon wrote scripts for musicals including “Little Me (1962), “Sweet Charity” (1966), “Promises, Promises” (1968) — based on filmmaker Billy Wilder’s executive-suite satire, “The Apartment” — and “They’re Playing Our Song” (1979). Among Simon’s original screenplays were the anti-New York satire “The Out-of-Towners” (1970), the sleuthing spoof “Murder by Death” (1976) and “The Goodbye Girl” (1977), which featured Mason and Richard Dreyfuss (in an Oscar-winning role) as reluctant Manhattan apartment-mates who fall in love. In October 1976, Simon wed Mason — three months after the death of his first wife, Joan Baim. His play “Chapter Two” (1977), about a widower who suffers guilt from his remarriage, foreshadowed the collapse of the Simon-Mason union. In 1999, he married actress Elaine Joyce. In addition to his wife, of Manhattan, survivors include two daughters from first marriage, Ellen Simon and Nancy Simon, both of Santa Barbara, California; a stepdaughter he adopted, Bryn Lander Simon; two stepchildren, Taylor Van of Beverly Hills, California, and Michael Levoff of Manhattan; five grandchildren and a great-grandson. Simon died at a hospital in Manhattan of pneumonia, said his friend Bill Evans, director of media relations for the Shubert Organization production company in New York. Many of Simon’s later comedies, including “Jake’s Women” (1992) and “The Dinner Party” (2000), had short Broadway runs, but his most venerable plays were revived with new generations of stars. In a 2010 interview with the Jewish Chronicle, he recalled the thrill of getting some of his first laughs while writing for Caesar, one of the biggest stars on television. “In the writers’ room you fought for your life and your laughs,” Mr. Simon said. “Sid Caesar would sit in the middle. He would come in the morning take his pants off and sit on a stool in his shorts.